Business Environment. The two organisations I have chosen are Tesco and McDonalds. Ownership, business sector and purpose. 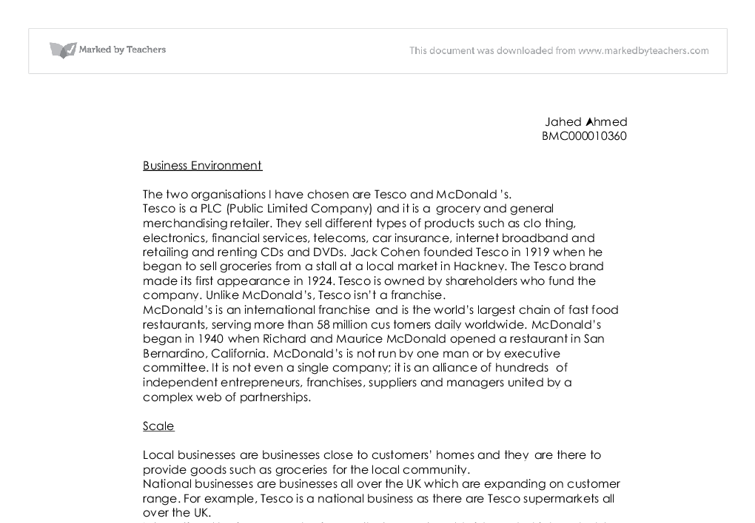 Jahed Ahmed BMC000010360 Business Environment The two organisations I have chosen are Tesco and McDonald's. Tesco is a PLC (Public Limited Company) and it is a grocery and general merchandising retailer. They sell different types of products such as clothing, electronics, financial services, telecoms, car insurance, internet broadband and retailing and renting CDs and DVDs. Jack Cohen founded Tesco in 1919 when he began to sell groceries from a stall at a local market in Hackney. The Tesco brand made its first appearance in 1924. Tesco is owned by shareholders who fund the company. Unlike McDonald's, Tesco isn't a franchise. McDonald's is an international franchise and is the world's largest chain of fast food restaurants, serving more than 58 million customers daily worldwide. McDonald's began in 1940 when Richard and Maurice McDonald opened a restaurant in San Bernardino, California. McDonald's is not run by one man or by executive committee. It is not even a single company; it is an alliance of hundreds of independent entrepreneurs, franchises, suppliers and managers united by a complex web of partnerships. Scale Local businesses are businesses close to customers' homes and they are there to provide goods such as groceries for the local community. National businesses are businesses all over the UK which are expanding on customer range. For example, Tesco is a national business as there are Tesco supermarkets all over the UK. International businesses are businesses that are set worldwide and which probably are a well known brand name. ...read more. A franchise is a right granted to an individual or group to market a company's goods or services within a certain territory or location. McDonald's is an example of today's popular franchises. An entrepreneur can choose to set up a new independent business and try to win customers. An alternative is to buy into an existing business such as McDonald's and acquire the right to use an existing business idea. A franchise is a joint venture between a franchisee who buys the right from a franchisor to copy a business arrangement and a franchisor who sells the right to use a business idea in a certain location. The advantages of a franchise are that the corporate image or logo and brand awareness of the company is already established. Customers are always more comfortable purchasing items from a familiar name or company they trust. Another advantage is that the franchisor usually provides extensive training and support to the franchise owner. Financing the business may be easier; banks are sometimes more likely to lend money to buy a franchise with a good reputation. The disadvantages of a franchise are that costs may be higher than expected. As well as the initial costs of buying the franchise, the business continues to pay management service fees and they may have to agree to buy products from the franchisor. 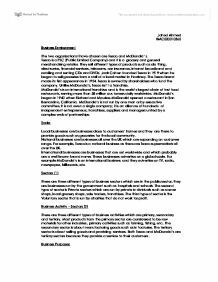 The franchise agreement usually includes restrictions on how the business should be run. The franchisee might not be able to make changes to suit their local market and all profits are shared with the franchisor. ...read more. The disadvantages of government owned businesses are that as most of the government companies take the support of the public, they cannot exercise better for the effectiveness of the organisation because they are not technical persons. Partnerships are businesses owned by two or more people. A contract called a deed of partnership is normally drawn up. This states the type of partnership it is, how much money and assets each party has contributed and how profits and losses will be shared. Doctors, dentists and solicitors are typical examples of professionals who may go into partnership together. They can benefit from shared skills but like the sole trader, have unlimited liability. A partnership can also have a sleeping partner who invests in the business but does not have dealings in the day to day running of the enterprise. The main advantage of a partnership is shared responsibility. One partner's strengths can complement another's. For example, if a hairdresser were in partnership with someone with a business background, one could concentrate on providing the salon service, and the other on handling the finances. There is less time pressure on individual partners. There is someone to discuss with over business decisions. The disadvantages of a partnership are that argument can arise over decisions that have to be made, or about the effort one partner is putting into the firm compared with another. The division of profits can cause problems. The deed of partnership sets out who should get what, but if one partner feels another is not doing enough, there can be dissatisfaction. A partnership has unlimited liability. ...read more. McDonald's have a strong tradition of training that is consistently applied to everybody in the business starting at crew level because they know its prominence to the bottom line of their business operation. All staff regardless full or part time workers , hourly paid workers, supervisors or managers have to under go a compulsory restaurant training. for production to the Social Security Offices regarding benefits * Administration of public cemetries (cemetery charges) Marriages / Civil Partnership Registrations * Issuing authorities for impending marriages/civil partnership registrations * Performing civil marriages/civil partnership registrations * Providing advice and general information about registrations 2.
gaining the consumers? confidence, this is because consumers will limit their spending and stop demining. This will cause businesses to reduce the prices of their products and goods so that they can break even, this will cause revenue to fall which will limit the cost of staffs, marketing mix and stop investing. The business has also tried introducing their technology providing newer and updated versions of their products and also providing new designs. What makes Apple sell the most is the design of their products and the name that the business has made for themselves internationally. This gap of 5.2% still gives China?s population the confidence to spend, however prices could rise over time. The BBC news has released a report about Chinas inflation rate ?China's rate of inflation has fallen in November to its slowest pace in 14-months.